Hosted by Lisburn Royal Black District Chapter No 1 , the ‘Last Saturday’ demonstration in the city saw 82 preceptories and 75 bands - headed by County Antrim Grand Black Chapter office bearers - walk the route from the Laurelhill Road to the demonstration field at Wallace Park. 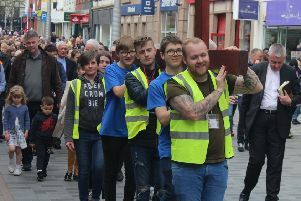 Sir Knights of six districts - Lisburn No 1, Ballymena No 2, Antrim No 3, Larne No 4, Ballymoney No 5 and Ballyclare No 6 - paraded streets lined with thousands of spectators. Sir Knight Edward Carson (Worshipful District Master, Lisburn) chaired platform proceedings and Sir Knight Rev Robert Campbell (County Grand Chaplain) conducted a religious service. Sir Knight Rev David McCarthy (Deputy County Grand Chaplain) led prayers and read the scripture lesson. Dundrod Silver Band, conducted by Louis Irvine, led the singing of hymns. Resolutions proposed by Sir Knight Ronald Hill (County Grand Master) were seconded by Sir Knight Kenneth Hull (Deputy County Grand Master). Guest speaker was Sir Knight Ivan Kelly (Assistant Sovereign Grand Master). while Sir Knight Cllr Thomas Beckett (Mayor of Lisburn & Castlereagh) added his welcome to all gathered. Sir Knight Brian Galbraith (District Foreman of Lisburn No 1 Committee) proposed a vote of thanks to all who supported the event and gave a special thanks to all who helped make it a success.